"Africa@War is a ground-breaking series concept, studying Africa's conflicts and military players in an informative and entertaining manner, examining some of the lesser-known campaigns and shedding new light on some of the better-known operations ... Both titles are great models of what the combination of authors and publishers can produce by way of useable case studies for the market place in a concise illustrated format. They are recommended as professional military education references." "Each of the books in this series is a well-documented and researched synopsis of the events that they are focused upon. They layouts and presentation are logical and of a very high quality ... As an introduction to this field of operation, this series is outstanding. A definite asset for those wishing to improve their knowledge and understanding of the development of successful, multi-faceted doctrine in the fight against insurgent/assymetric war." 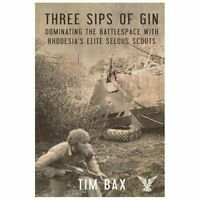 "Undoubtedly one of the most, if not the most, effective counter-insurgency units in the history of warfare"
This book is well worth the read if you have an interest in the Selous Scouts and the pseudo terr operations they conducted in the Rhodesian bush war.